No question that 2017 will hold a few surprises and challenges for all of us in international mobility. The global impact of Brexit, the new US administration, and further pressure due to the war for mobile talent are just some of the issues that foreshadow what the next 12 months will mean for international mobility. 1. Growing tensions in international relations: what will be the fall out of the new US Presidency and Brexit on international relations? If we are heading towards more economic barriers and a less open world, no doubt that talent mobility will suffer from stiffened immigration rules, stimulating the war for international talent. Will the protectionism of some nations stimulate the opening of others? Will this further boost the urge to develop regional / local talent? 2. Deeper impact of new technologies: corporations are finally leaving the nightmares of obsolete IT platforms to engage in new technologies allowing them to properly administer their mobile workforce from selection to repatriation. However, technology is not only transforming the way mobility is administered, it is also deeply transforming the whole mobility experience. As an example, it’s been 4 years now since NetExpat launched its NetExpat Community - just look at the dramatic changes that the largest social media platform for partners has induced! 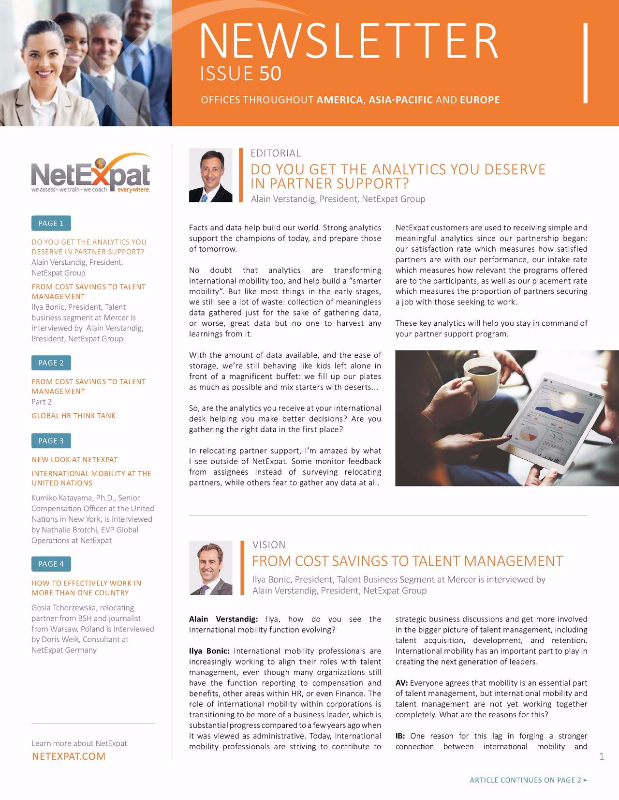 Thousands of relocating partners from all around the world are now connected through the NetExpat Community and are given the opportunity to meet other partners like themselves virtually and face to face. The NetExpat Community and its technology has completely transformed the sense of isolation for these partners into a sense of belonging. No doubt 2017 will bring us further technologies to offer a better experience to each mobile employee and their family, along with a more transparent, better cost-controlled and more compliant mobility. 3. Cost pressure: interesting to see how cost-cutting will evolve in 2017 as corporations have more cash now in 2017 than in 2016. As we see a further tightening of the war for mobile talent, will your company start to invest in its mobile talent pipeline again to grow its future value or sit on its cash in 2017? Make sure to read our future 2017 Insight articles to discover what some of the most seasoned international mobility and talent experts predict for 2017. Focus on the many benefits and opportunities – There are many benefits and opportunities to spending time living and working in another country. There’s so many new experiences to have and opportunities to discover and it helps to try and stay focussed on these when overwhelment and doubt creeps in. Write a list of the benefits of living and working in your chosen country and pin point your own personal goals. Establish what you would like to get out of the experience personally and think of ways in which you can work on achieving these goals. Identify your sources of support – Identify what your new support network looks like now that you’ve moved and use it. If your new network is slow to establish initially, how can you work on extending it in your new host country. Are there any classes or activities you enjoy doing in your spare time that you could get involved in? Or look at the NetExpat Community for support. Whilst you’re working on building your new support network, leverage off the one you have just left behind via Skype, Facetime, Social Media, E Mail or phone. The world is a lot smaller than it used to be and it’s easier than ever to stay in touch with friends and loved ones. Be Kind To Yourself – Having been through a country relocation myself, I understand that it can feel like you’re on an emotional rollercoaster at times. Rest assured that this is a completely normal reaction to change and the mix of highs and lows will pass. They say it takes six to eight months to really settle into a new country and feel completely comfortable with your new environment/work so whilst you’re working your way through this settling in period, be kind to yourself and be patient with how you’re feeling day to day. Make The Most Of Your Free Time – Whether you’re working, studying or managing your home during this period of relocation, make plans for you and your family to experience everything your host country has to offer. For example, for those settled in the UK, book tickets for a show, see the many fantastic attractions that make the UK unique or take a day trip to one of the many free museums. Work on making some amazing memories you can take back home with you once the assignment is complete. Prioritise – It can feel that there is so much to organise when you initially move to a new country and it can feel overwhelming. Try to prioritise what needs to be done first and focus on one action at a time. Make a list of things to do in those initial few weeks and once each is complete strike a big bold line through it. You’ll be surprised how satisfying it is to see all those tasks marked off as each day passes and you become more settled! It’s OK To Feel Lonely, Frustrated, Angry, Fearful etc – It’s very common for negative feelings to creep in once the adrenaline of the move has subsided and your days are less busy managing the logistics of your recent relocation. Again, this is a normal reaction to transitioning into a new and unfamiliar environment. Acknowledge how you're feeling and that it’s ok to feel that way and then explore ways in which you can feel more connected to and positive about your new environment. Work on determining what you need to do personally to alleviate these feelings (and this might be different for each individual). Talk to your friends and family about how you’re feeling and be open with them about the support you need from them. Do you get the analytics you deserve? We are proud to announce the release of our newly enhanced ExpAdviser® 2016. The survey time has been reduced, the report has been completely redesigned to offer stunning new graphics which are even easier to grasp, and a few new cultural dimensions have been added: less time with an even greater impact! As the leading intercultural and behavioral self-awareness tool, the new ExpAdviser® 2016 will boost, more than ever, the self-awareness and self-confidence of all your mobile employees and will increase the success rate of your international assignments. Contact us at to learn more. 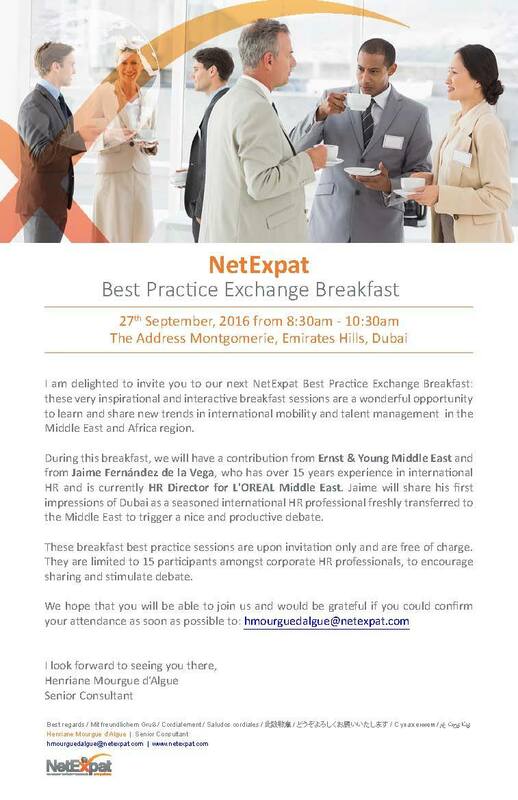 Join Ernst & Young Middle East, along with Jaime Fernández de la Vega, for a highly interactive best practices exchange breakfast with corporation peers from around the globe as we discuss some of the hottest topics in global mobility to date. These very inspirational and interactive breakfast sessions are a wonderful opportunity to learn and share new trends in international mobility and talent management in the Middle East and Africa region. Space is limited to 15 participants, is free of charge, and is upon invitation only so don't wait to contact us at to reserve your seat for this must-see event. We hope to see you there!